Birthday Photographer (282/365 v2.0) – Annoyingly Boring? Big Bird takes a time out from the festivities to pose for a photo. It’s funny, I knew I was going to do something Sesame Street related today. What I did not know is that when I went rummaging through the toys I would find one with a camera? How fitting. Great minds, indeed! 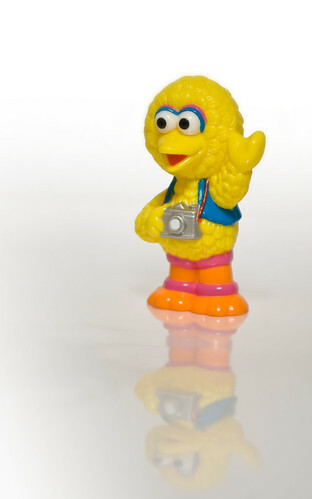 Makes me wonder how many camera-themed Sesame Street toys you could find, if you looked…! .-= christine´s last blog ..C is for Camera =-. Now I see a big bird photographer. How I wish big bird can shoot me when I will be celebrating my birthday…. Indeed, sesame street was my favorite for kids show when I was a little boy…. Nice photograph and happy birthday to the celebrant!!!! God bless and Good luck!!!!!! .-= Valentine Game, Valentine Flowers´s last blog ..Crafts Valentine =-.